This topic describes the options on the WebFOCUS Add-in menu. Except for Settings, these options are also available from shortcut menus in Excel. Create Query. Opens the Web Server Connection dialog box to enable you to connect to WebFOCUS. It continues by opening the Data Source Selection dialog box to enable you to select a Master File. It then opens the WebFOCUS InfoAssist tool, where you can create a query. This option is available for new queries only. Edit Query. Opens the WebFOCUS InfoAssist tool, where you can edit a query. This option is available for existing queries only. Edit Query is not enabled for password-protected cells. Edit Connection. Opens the Web Server Connection dialog box, where you can edit the connection settings including the Web Server URL, the HTML Alias, and the Client Path. The ability to edit connection information saves time when you are reusing reports and helps facilitate the sharing of workbooks across an organization. This option is available for existing queries only. Data Range Properties. Opens the External Data Range Properties dialog box, where you can set Excel query properties. For more information, see Setting Query Properties. This option is available for existing queries only. Refresh Data. Refreshes the data in the existing report query. This option is available for existing queries only. Refresh is not enabled for password-protected cells. Settings. Opens the WebFOCUS Quick Data Settings dialog box, as shown in the following image. On-Demand Reporting Server Logon. When this check box is selected, a user will be prompted to log on to the Reporting Server the first time that a connection to the server is made during an Excel session. When this check box is clear, a user will be prompted to log on each time that a request is made to the Reporting Server during an Excel session. Show Properties dialog when the query is created. When this check box is selected, the Properties dialog box opens every time you execute a new query. This dialog box enables you to direct the Quick Data add-in to overwrite or protect existing data in your spreadsheet before transferring new report data. Enable Tracing. 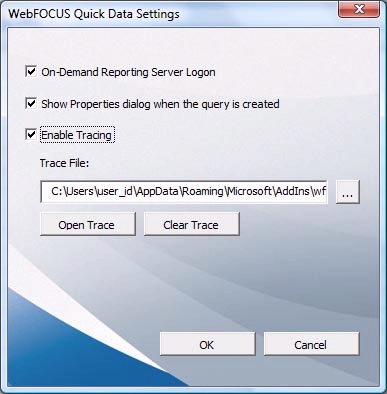 When this check box is selected, you can capture WebFOCUS Quick Data information in a trace file to troubleshoot communication problems and issues that may occur when you attempt to create and run report requests. Traces are captured for the duration of a single active Excel session. Tracing is automatically turned off when you close an Excel session. The trace file content is cumulative, meaning that trace information will be added to the file from each session in which tracing is enabled. When you select this check box, the Trace File field is automatically populated with the full path to the trace file. The path includes the trace file name. You can change the location and name of the trace file by typing the changes in this field, or by clicking the ellipsis and browsing to a new trace file location. To view the current trace file, click Open Trace. To delete the contents of the current trace file, click Clear Trace. You can forward your trace file to Information Builders Customer Support Services (CSS) for analysis by the technical support team. Web Servers List. Opens a dialog box that displays a list of configured web servers, as shown in the following image. You can move the servers up or down in the list to change the order of their appearance, and delete servers from the list.